Palmer Engineering was selected by the WVDOT to provide construction plans for a 1.7-mile section of Corridor H. This section is located slightly west of the Mount Storm Power plant and will bypass a steep, winding portion of WV 93. The highway, a great example of modern roadway design, features the latest in WVDOT, AASHTO, WVDEP, and WVDNR guidelines. 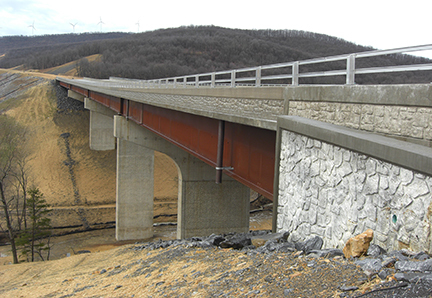 This project included the design of a 4-span and a 3-span bridge, truck escape ramps, 2 million cubic yards of excavation, right-of-way plans, HEC-RAS stream analysis, surveying, sediment and erosion control plans, value engineering study, access road analysis report, truck-climbing lane analysis, 404 permit drawings, and an NPDES permit. Palmer led the complex permit approval process for this unique project. The superstructures of the two curved bridges on this project are weathering steel plate girders and consist of a 540-foot-long three-span structure, and a 752-foot-long four-span structure. The structures are both wet crossings, one spanning Elklick Run as well as WV 93 and the other tributary of Elklick Run and Greenland Road. Both bridges are supported by integral abutments founded on a single row of piling and large hammerhead piers with heights ranging from 70 feet to 134 feet. The piers are supported by spread footings founded directly on rock and pile foundations. To reduce costs, one of the bridges was shortened by approximately 60 feet by using an MSE wall combined with an integral abutment.